kam is another of our half-finished projects, and in many ways our favorite. 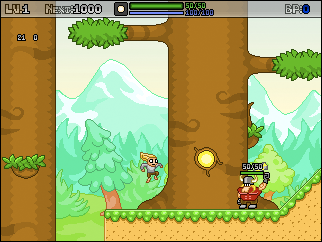 The main character, the NPC's and the enemies are all awesome (especially Thor, the god of thunder). The graphical style is great as well, since it's really simple (which is good for us lazy people) but still looks pretty good. The game was done in GameMaker, with Jimmy doing the programming. However, Nicklas just started working on a new version using Scirra's Construct (you can play it here). It's kind of a SNES style action platformer. The dude with the hair can perform all sorts of cool moves; he can run, jump, glide, wall-jump, swim, dash, hairachute (hair parachute, ba dum pish! ), plus attack with a variety of fun weapons accompanied by new outfits (in the demo you're limited to jumping around and hitting things with your hammer).